A “hot” Jupiter is a planet that orbits very close to its parent star — only a few stellar radii away. For comparison, our Solar System’s innermost planet, Mercury, orbits ten times further away from the Sun, about 80 Solar radii. Being close in makes them orbit quickly and makes them easier to detect with the Doppler method: hot Jupiters orbit every 3-4 days (their year is that long!) while Mercury takes 88 days to orbit the Sun. Such hot Jupiters are very likely to transit their host star (well, ~10%, but that’s pretty high), so the most efficient searches for hot Jupiters are those that look for the transits of planets, as opposed to radial velocity searches which find the planets first, then look to see if they transit. 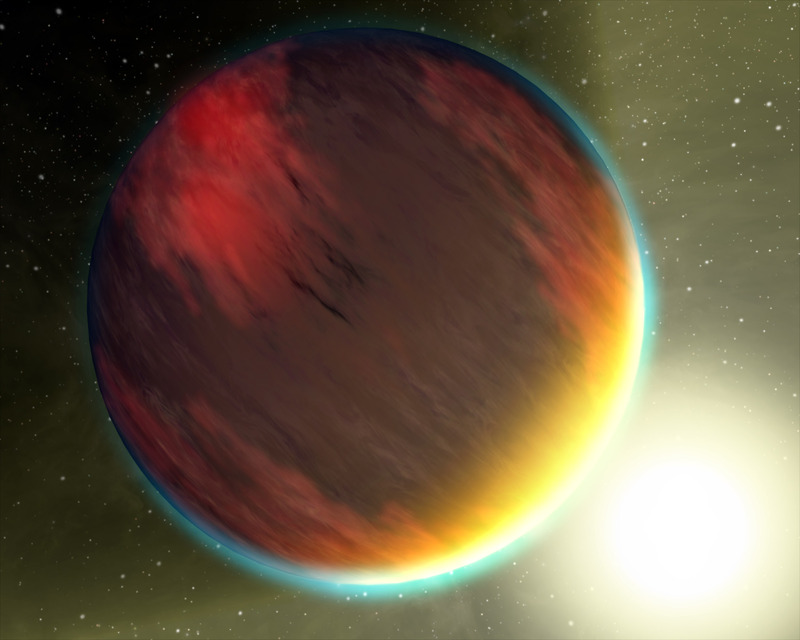 The exoplanet usually hailed at the first around a normal star, 51 Pegasi b, was a “hot Jupiter”, orbiting about every 4 days and having about half the mass of Jupiter. Lots of others have been discovered, and there is a general sense that they’re pretty common. This is mostly because they seem to be found so frequently by transit surveys, and because they are so interesting to study that there are a lot of papers and press releases written about them. But in reality 51 Pegasi b is a member of a pretty select class of object. There are “only” 23 exoplanets discovered with radial velocities that have periods shorter than 10 days and masses above 0.4 times that of Jupiter. Of these, 2 transit (HD 189733 b and HD 209458 b, the latter being the first planet known to transit its host star). This is consistent with the rate expected from geometry of about 10% (that is, since orbital planes are random, only 1 in 10 hot Jupiters will just happen to transit). The actual frequencies of hot Jupiters around normal stars is surprisingly hard to figure out. Kepler reports a very low rate: around 0.5% of stars have hot Jupiters (many of these may be false positives, so the true Kepler rate may be only 0.3%), but the Keck planet search reported a higher number that is consistent with the other radial velocity surveys: more like 1.2%. What’s going on? To check, I recently ran the numbers again for the entire Lick and Keck radial velocity surveys. I scanned our archives for every star for which we had made at least 4 measurements of its velocity. Since our precision is below 5 m/s, even with the old Lick data, we can easily detect any hot Jupiter (which typically generates a signal of hundreds of m/s, with only a couple of measurements). So we should have a complete search here. We find numbers consistent with our old reported value: 1.2% of stars have detected hot Jupiters. But this is much higher than the Kepler value, and much higher than the values from transit searches by the microlensing groups, which also agree with Kepler. What’s going on? There are three possibilities: either some of our planets aren’t real hot Jupiters, Kepler and the deep transit surveys like OGLE are missing at least half of the hot Jupiters in their sample, or the populations of stars are different. The first isn’t likely: even aside from the fact that we have ruled out all other explanations for our signals, out of 22 hot Jupiters, 2 transit, which is about the right number one expects. If our true hot Jupiter rate were only 0.3% then only 5 of our signals would be real, in which case we would have a transit rate of 2/5, which would be four times the expected value. Pretty unlikely. The statistics of transit searches are really hard, and I think that there has always been some skepticism about whether they can be done correctly, perhaps making their numbers a bit dubious. But Kepler has a hard time missing hot Jupiters because their signal is so strong, so the fact that the Kepler number is consistent with the OGLE numbers validates the OGLE teams’ statistics. They can’t be missing over half of the transits in their field of view. So those numbers seem secure. So that leaves population, apparently. It seems that the radial velocity surveys, which probe nearby stars (almost all within about 200 pc) are finding a “hot-Jupiter rich” environment, while Kepler, probing much more distant stars, sees lots of planets but hardly any hot Jupiters. What is different about those more distant stars? We’ll soon know if it’s metallicity, as soon as spectroscopic studies of the Kepler field are completed. What else could it be? Age? Dynamical history? This entry was posted in science, Uncategorized and tagged science on July 5, 2012 by jtw13. Jason, I just found this, and it’s a really cool article. Thank you for posting it. I’ve raised the question before whether the Kepler sample is similar enough to the solar neighborhood sample to use Kepler’s estimates of eta_Earth in designing a TPF mission. The instant response was yes, of course, they are exactly the same, these targets aren’t THAT far away. Anyway, I’ll be anxious to hear how that question gets resolved. Thanks Copy editor, for that typo correction. Microlensing and the OGLE transits both have very hard statistics because you don’t know the masses and distances to the stars you’re measuring, in general. You have to build a model of the Galaxy and do that statistically, except for the few stars you have the opportunity to study in detail (because they gave you a signal) with big telescopes or Hubble (they tend to be fainter and more crowded). The hard work that, for instance, Gould has done on this has held up very well in light of Kepler. I don’t think the Cassan result is comparable because, as you note, it’s about all planets bigger than Earth, and I’m only talking about Hot Jupiters. I don’t think it’s incompatible with Kepler, but I’d have to take a closer look. Why are the statistics of transits harder than e.g. r.v. or microlensing?